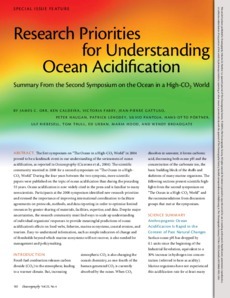 The first symposium on "The Ocean in a High-CO2 World" in 2004 proved to be a landmark event in our understanding of the seriousness of ocean acidification, as reported in Oceanography (Cicerone et al., 2004). The scientific community reunited in 2008 for a second symposium on "The Ocean in a High-CO2 World." During the four years between the two symposia, more scientific papers were published on the topic of ocean acidification than during the preceding 55 years. Ocean acidification is now widely cited in the press and is familiar to many nonscientists. Participants at the 2008 symposium identified new research priorities and stressed the importance of improving international coordination to facilitate agreements on protocols, methods, and data reporting in order to optimize limited resources by greater sharing of materials, facilities, expertise, and data. Despite major uncertainties, the research community must find ways to scale up understanding of individual organisms’ responses to provide meaningful predictions of ocean acidification’s effects on food webs, fisheries, marine ecosystems, coastal erosion, and tourism. Easy-to-understand information, such as simple indicators of change and of thresholds beyond which marine ecosystems will not recover, is also needed for management and policymaking.